Tramjatra is a collaborative public project exploring a dialogue between two former British colonial cities through the medium of tramways to manifest a network of temporary public art works, participatory events and publications in both cities, including a book titled tramjatra. Essays by Suzie Attiwill, Dipesh Chakrabarty, Soumitra Das, Mick Douglas, Gayatri Spivak, Catherine Murphy, Fazal Rizvi and Bruce C. Wearne. 304pp colour, soft cover, 120 x 160mm. “exhilarating” – Fiona Capp, ‘tramjatra review’The Age, Saturday 29 April 2006, p25. Follow the way of the tram through two cities with tracks of a shared past. Welcome to networks with promise for the future. Tramjatra undertakes a journey between Kolkata (India) and Melbourne (Australia) through the medium of tramways. This form of creative and critical globalisation from below, built on friendship and dialogue, shows a way forward. In the context of increasing debates about sustainability and the impacts and processes of globalisation, tramjatra makes new connections through a public arts practice of inter-cultural dialogue. Over the past decade Kolkata’s struggling tramways have faced a persistent threat of closure and the operation of Melbourne ‘s tramways has been privatised and automated. By traveling between two different urban realties, tramjatra provokes both a local and global engagement in the challenges of moving and being moved in contemporary urban life. The book explores the poetic relationship between the practical movement afforded by tramways as a mode of public transport, and the contemporary social, political, economic and creative forces of movement brought to tramways. 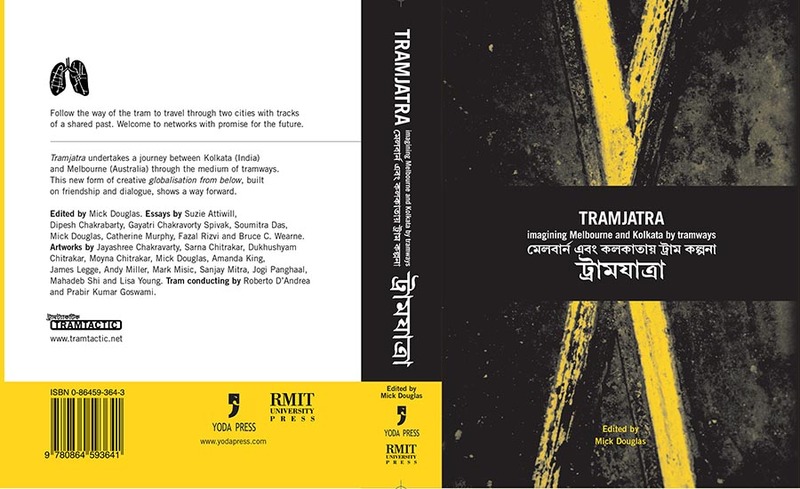 Essays discuss historical links between Melbourne & Kolkata; examine relations between memory, tram travel and ticketing; locate tramjatra in the context of debates on transculturalism, international education and notions of public art; and unravel issues of translation in inter-cultural arts practice. Essays by Suzie Attiwill, Dipesh Chakrabarty, Soumitra Das, Gayatri Spivak, Catherine Murphy, Fazal Rizvi and Bruce C. Wearne. Artworks by Jayashree Chakravarty, Sarna Chitrakar, Dukhushyam Chitrakar, Moyna Chitrakar, Mick Douglas, Amanda King, James Legge, Andy Miller, Mark Misic, Sanjay Mitra, Jogi Panghaal, Mahadeb Shi and Lisa Young. Tram conducting by Roberto D’Andrea and Prabir Kumar Goswami. Passengers contributions by Anirban Basu, Paul Bateman, Ranjita Biswas, Keith Butler, Aparna Das, Lyall Johnson, Malcolm Just, Mary Kalantzis, Paul Molyneux, V. Ramaswamy, S.R. Rajen. After the book about the project ‘tramjatra: imagining Melbourne & Kolkata by tramways’ was published in Australia and India, Mick Douglas and tramjatra founding friends walk the tracks of both cities at night and talk of their journeys. Marie Sierra, ‘tramjatra: book review’ in Art Monthly, no. 191, July 2006, pp18-20. Mantej Singh, ‘Indian home cooked dinner and the CCD cuisine’, in Scott O’Hara (ed. ), Artwork issue 56, 2003. Suzie Attiwill, ‘tramjatra’ (daily p3 newspaper column) The Statesman – Kolkata, from 20 Feb to 31 March 2001. John Thackara, ‘Speed’, in John Thackara In the Bubble: Designing in a Complex World, Cambridge Massachusetts: MIT Press, 2005, pp29-50. Kevin Murray, ‘tram ways’, The Age Saturday Extra, 3 Nov. 2001, p3.